One item of interest that we’ve been waiting to touch upon is AAN. We’ve watched as the stock has taken quite a beating over the past few weeks, and are presently scanning for a bottom. After losing so much ground over so short a time period, when support is found, the recovery on AAN could end up allowing for some rapid profits in the options chain. While we need to first observe a solid base of support before setting our short-term call strategy, there are already a pair of longer-term contracts that we’re going to put on watch. The November 22nd $29 and $30 Calls (trading yesterday at 3.20 and 2.05, respectively) could see significant rises in value once a reversal occurs on the chart. We brought RFMD up as a topic of discussion this past Friday, mentioning that the spike catalyzed by the release of record revenues was likely to lead to a classic ‘dip-and-rip’ scenario. That keen instinct has thus far paid off, as the stock did indeed dip to 10.74 before rebounding as high as 11.79 (+10%), achieving higher lows each day over the past four sessions. As a result of the trend, we’re going to have our eyes on the September $12 Calls, which closed at .70 yesterday. FTNW hit our news scanner this morning and will be a stock that we monitor as the trading session opens today. The PR alludes to some lucrative contracts, so we’ll be interested to see how it reacts to such significant press. CETV is a stock we’ve looked in upon a few times over the past year or so, first catching it all the way back in May of 2013. We like to keep a continuous eye on all of our past winners in the event that they might bring future opportunities, and that’s why we’re going to revisit CETV this morning. HAMILTON, BERMUDA, July 30, 2014 – Central European Media Enterprises Ltd. (“CME” or the “Company”) (NASDAQ/Prague Stock Exchange – CETV) today announced financial results for the three and six months ended June 30, 2014 . INOH popped up on our scanners this morning as a sub-penny play with bottom-bounce potential. The stock is coming off of a recent sub-.001 bottom, and began to rebound during yesterday’s session. INOH had a rapid spike to more than .008 back in June, so we know the potential for a move is there, and will keep a close watch over INOH in coming sessions. Speaking of bottom bouncers, we just wanted to make a quick mention of yesterday’s extended watchlist play, PGTI. The stock gapped up and reversed course, trading in a daily range from 8.76 – 9.77, an intraday move of 11.5%. We’ll be looking in on PGTI today to see if it can maintain course. XUII continued to run following the afternoon update we sent out yesterday, achieving a new high of day just prior to the close at .0026, marking a full 100% move in just a single day. The stock closed just one tick below at .0025, and ended up trading 744M shares, well over 10x the 3-month average volume going into the session. Moving forward, we’ll be keeping a close eye on XUII, which will need to maintain support at or above .0018 in the worst case scenario to hold our interest. That would be our theoretical stop-loss point, and as you can see on the included chart, the next major area of resistance doesn’t crop up until .0033. Based on the momentum into yesterday’s close, we may be looking at a gap up from XUII first thing this morning. Ideally we’d like to see the 50DMA of .0024 hold as support. Reigning as one of our most successful picks of all time, PLUG has appeared in our reports more than 40 times since we first caught it at .135, near all-time lows on February 28th, 2013. We tracked this play from those levels all the way up to an astonishing high of 11.72 roughly a year later, so PLUG will always hold a special place in our trading hall of fame, and never really get taken off of our watchlist. We want to bring PLUG back to the forefront of the conversation again this morning, on the heels of a PR that just hit the wires, regarding a big purchase order from the world’s largest retailer. The stock is gearing up for a gap-up in pre-market trading, so we’ll want to keep a sharp eye on this one. This is the kind of press that can lead to rapid short-term gains. We wanted to send out a quick update to our subscribers this afternoon regarding this morning’s alert on XUII. The stock met our expectations nicely, coming out of the gate strong. It ran from a low of .0013 and broke through both of the resistance areas we pointed out at .0018 and .0024, going as high as .0025. That move was good for intraday gains of up to 92% on roughly 10x the 3-month average volume traded, and was certainly a good way to start off the week! Congrats to anyone who was able to take advantage of that timely alert, and be sure to stay with us as we track this and other hot opportunities on an ongoing basis. We’ll be monitoring XUII as the week commences, looking for XUII to maintain support above that all-important .001 mark. 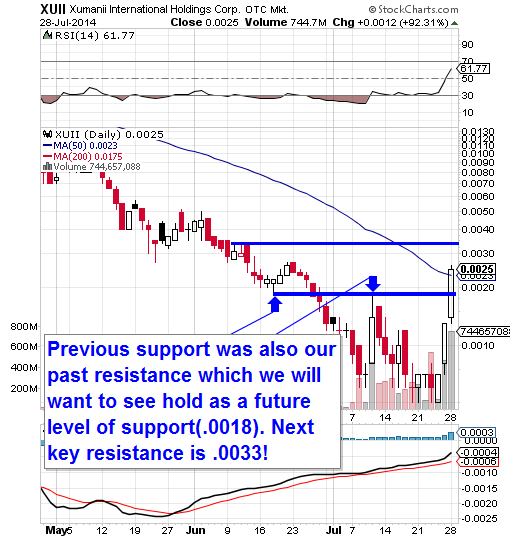 As far as resistance is concerned, main areas on the current chart are .0018, and beyond that, the 50DMA of .0024. Xumanii (DBA Imerjn, OTCQB: XUII), announced that it has completed the acquisition of Rocky Mountain Tracking “RMT”), an established provider of GPS tracking solutions in North America. The Company has signed a definitive agreement to acquire RMT Leasing Inc. and its subsidiary Rocky Mountain Tracking Inc. This transaction is not subject to any further action and is effective immediately. Another sub-penny that is currently catching our attention is GRDO. As per a recent corporate update, the company is working diligently toward providing adequate information to come current with their filings, and lift itself from non-reporting status. 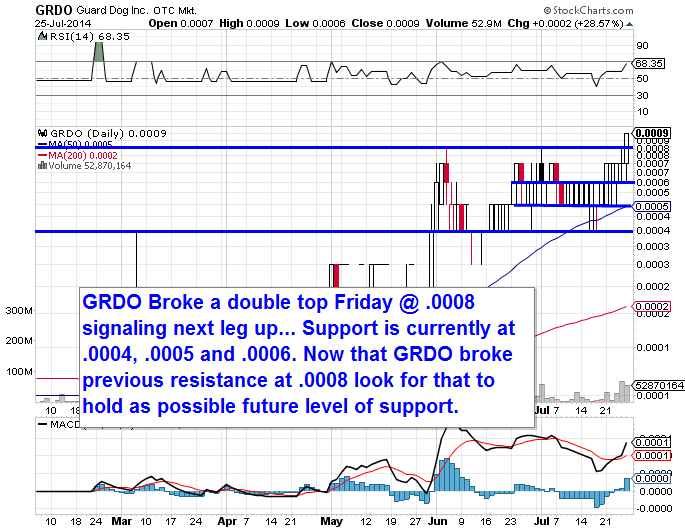 On the chart last week, we saw the break of a recent double-top formation at .0008 as GRDO closed at .0009 on Friday. The three lines on the bottom of the included chart below represent current support from .0004-.0006, and ideally we’d like to see the stock hold above .0008 to start things off this week. Conditions do appear favorable; the MACD just made a bullish cross, and is showing rapid upward divergence, while the RSI is headed sharply toward the power zone. We left things off last week with an extended watchlist that included three potential bounce-plays. KNDI was just coming off of a recent bottom and looking like a reversal was in the cards, while BCOV and AWRE were in free-fall and still searching for their bottoms. KNDI found its footing, and both BCOV and AWRE bounced as we suspected they might. All three will remain on our watchlist to begin the week.